This Penthouse resides in the glass high-rise Hotel on Rivington by the Lower East Side. 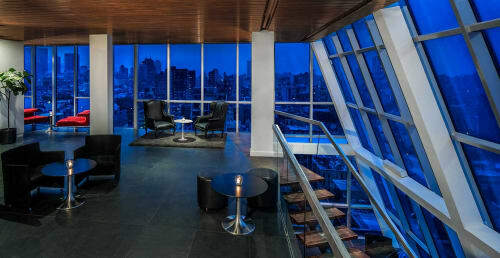 Named as the “Sexiest Hotel in NYC” by Time Out NY, it's stunning triplex Penthouse offers over 3,500 square feet complete with a 1,000 square-foot roof deck showcasing the best panoramic views of Manhattan. This event space is ideal for weddings, cocktail receptions, private dinner parties, photo shoots and other unforgettable occasions. Great view of the sunset. Picture perfect. The view from this penthouse is beautiful and the event coordinator was extremely helpful.